As I write this, I am sitting on the couch watching the NCAA March Madness championship game (well listening and glancing over my laptop), but I couldn’t miss the opportunity to tell you about the awesome #AGtivities that are happening at my Alma mater this week. Students from the Purdue College of Agriculture are hosting Purdue Ag Week on campus! Ag Week is a student-organized event at Purdue University that aims to show the campus what agriculture gives. The Purdue Ag Task Force, a Purdue student organization, leads the event and aspires to make Purdue Ag Week an event where the various facets of local, national and international agriculture are understood and celebrated. 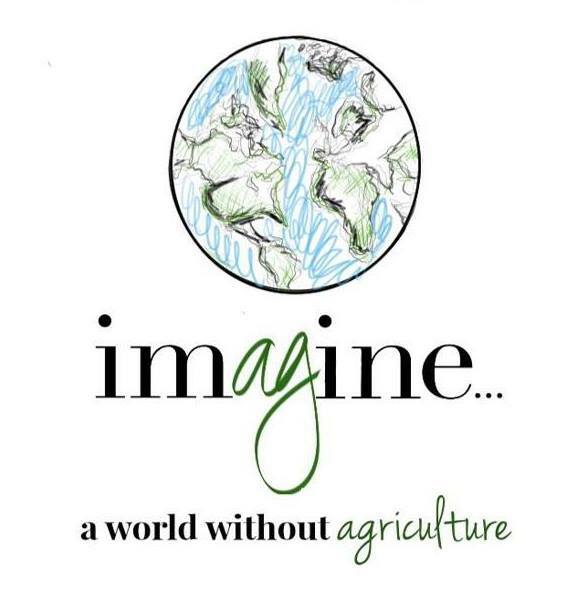 This year’s theme is “ImAGine a World without Agriculture.” There will be over 25 different events allowing students to learn about various aspects of agriculture. Each event is organized by a different College of Agriculture group. Events kicked off on Sunday with the Farmer 5k to raise money for Food Finders Food Bank, and a private screening of the movie, Farmland, which highlights the lives of six young farmers and the risks they face every day to run their own farms. I have also had the opportunity to see this movie, which hits theaters May 1, and I really hope you guys check it out at your local theater (but that’s a separate blog post all in itself). Monday’s list of “AGtivities” included a SSC table where students could learn about sustainable agriculture, a Food Science – the Missing Link event which featured how ice cream is made and handed out samples to students, and an event that has a special place in my heart, Milk Monday! When I was at Purdue, my club, Ag Communicators of Tomorrow, teamed up with Dairy Club to create Milk Monday as part of “Grand Alternative” events for Grand Prix week. In partnership with Dairy Promotions of Indiana, we handed out free grilled cheese and milk to students as a way to promote the benefits of milk and the dairy industry. Since then, the event has been continued each year by Purdue Dairy Club and was held today as part of Purdue Ag Week. 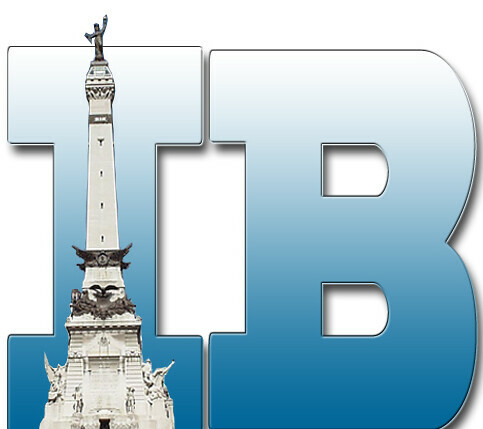 Check out their recap from today’s Milk Monday festivities! 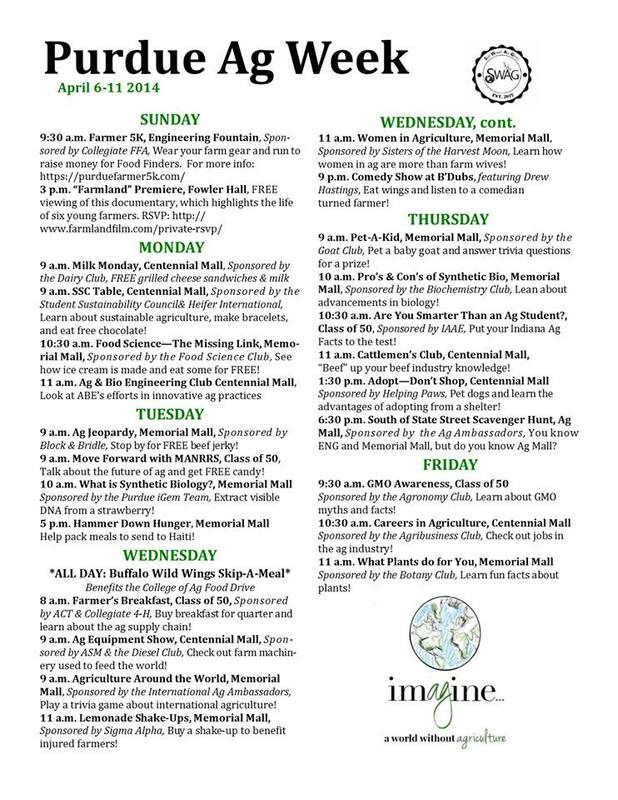 Purdue Ag Week is off to a great start and still has plenty of great events left, so be sure to check them out if you’re around campus this week! I know not all of you will be able to make it to campus, so if you are out of town like me, but still want to learn more and keep up with Ag Week AGtivities, be sure to Like Purdue Ag Week on Facebook and follow @PurdueAgWeek on Twitter! Keep up the great work, Purdue ag students! 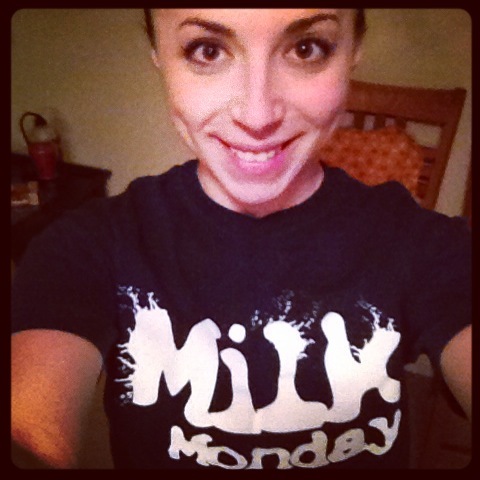 I’ll be here cheering you on with my Milk Monday shirt! Posted on April 7, 2014, in Ag Events, Agvocating, Purdue and tagged #imAGine, AGtivities, agvocating, Emmy Kratz, Food Finders Food Bank, ImAGine a World Without Agriculture, Purdue Ag, Purdue Ag Task Force, Purdue Ag Week 2014, Purdue Agriculture Communicators of Tomorrow, Purdue College of Agriculture, Purdue Dairy Club, Purdue Farmer 5K, Purdue Milk Monday, Purdue student organization, Purdue University. Bookmark the permalink. Leave a comment.